People often ask "What's the most dangerous thing you can do on a horse? Is it polo? Eventing? Bronc busting?" These sports are certainly risky. But statistically, the most dangerous thing you can do on a horse is get on one without a helmet on your head. A helmet cannot protect you from every type of injury and it may not even prevent you from sustaining brain damage if you fall off while wearing it. But if you do fall on your head, you are more likely to be gravely harmed if you are not wearing a helmet than if you are. The majority of incidents that result in the death or incapacity of the rider are head injuries. The vast majority of people who die from these head injuries were not wearing helmets. The extent to which riders wear protective headgear varies widely from sport to sport. Most organized English sports, and all sports governed by the United States Equestrian Federation, require riders to wear helmets when they are competing, but the disciplines each have their own cultures when it comes to riding outside of the show ring. Riders in some disciplines always wear helmets; those in other disciplines never do. In 2011, these cultures are all moving toward more helmet use. Some of the move toward helmets is institutional. For instance, the rules in dressage competitions changed this year, so that now riders at the national levels are required to wear helmets at all times when they are mounted at the show ground. (Riders who are only showing at international levels can still ride around in bowler hats, in the arena or out of it.) Polo is also moving toward a greater appreciation for protecting heads. Today, players are required to wear helmets in the game, but there is no stipulation that these helmets need to have passed any safety testing whatsoever. In fact, the majority of polo helmets in use today provide far less protection than most people know. An expert at a major national testing lab told me that most polo helmets are essentially as protective as a beanie with a propeller on top. As of January 2012, six months from now, all players will be required to wear helmets that have passed stringent safety tests. It may be a very long time before polo people start wearing helmets when they are not in a game, but there does seem to be a small trend in that direction. Another part of the helmet movement is cultural and grassroots in nature. There are several national groups started by ordinary riders that advocate helmet use. One new one is Riders 4 Helmets, which sponsored a "National Helmet Awareness Day" on June 11. (www.riders4helmets.com) Riders 4 Helmets was inspired by Courtney King Dye, an international dressage competitor based in Florida who is slowly recovering from a devastating head injury she suffered when she fell from a horse she was schooling. She was not wearing a helmet. Helmet advocacy has not moved into the Western disciplines in any big way. In fact, almost no Western riders wear helmets, even when they are competing in fast sports such as barrel racing. This is as true for children as it is for adults. Fashion dictates a lot of this: Western riders wear cowboy hats so they look like Western riders. But it is also true that people involved in Western sports seem more cavalier about safety than their English cousins. We have seen parents at a local Western event actually strap a little boy to the saddle of a hot horse he couldn’t control, and then shove him into the arena to run a barrel pattern. There was a frightening wreck that involved flipping over a fence and dragging, but the boy did not appear to be seriously injured, and no one seemed to blame the parents. 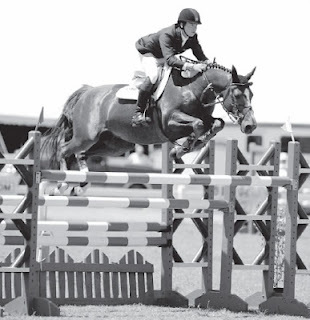 It would be hard to imagine a similar scene taking place in a junior jumper class at Highfields. It probably is easier to fall off if you are riding English than if you are riding Western. You are also more likely to fall if you are an inexperienced rider than if you are a professional. But these are not good reasons to forego protective headgear. At the South Carolina High School Rodeo Association finals in Pendleton this spring, a 12-year-old girl who was riding outside of the arena died of a head injury when her horse, who was walking, stumbled and fell on her. Over the past six years, at least two people under the age of 25 who used to ride in Aiken have died of head injuries that were the result of falls. One was a little girl riding her horse down a dirt road; the other a skilled polo pony trainer whose horse spooked and he hit a tree. Neither was wearing a helmet. Would they have died if they had been wearing helmets? Maybe, maybe not. We can only speculate. When riders have bad falls that wreck their helmets but leave their heads relatively okay they tend to say "If I hadn’t been wearing a helmet, I would have died." This is only speculation too. But if I had to wonder "what if" I would rather be asking if my injuries would have been worse if I hadn't been wearing a helmet than if I would have been fine if I had only put one on that day. Wearing a helmet is smart, and smart is always in fashion. Protect your brain. It's not like your arms, your legs or even your eyes and ears. A brain is unique. You only get one.